The key findings from Trial 1 are shown in Table 1. The key findings from Trial 2 are also shown in Table 1. Tedizolid phosphate has no contraindications. 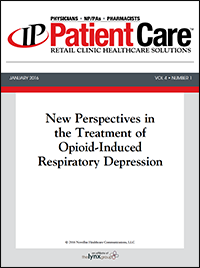 A new treatment option for ABSSSIs became available in June 2014 when the FDA approved tedizolid phosphate. The safety and efficacy of tedizolid phosphate were evaluated in 2 clinical trials that involved 1315 patients with an ABSSSI. Based on its early and sustained clinical response, tedizolid phosphate was shown to be as effective as linezolid for the treatment of an ABSSSI. Tedizolid phosphate is available as an injection for IV use and in tablet form for oral administration. The most common adverse reactions associated with tedizolid treatment include nausea, headache, diarrhea, vomiting, and dizziness. Center for Drug Evaluation and Research. Guidance for industry. Acute bacterial skin and skin structure infections: developing drugs for treatment. October 2013. www.fda.gov/downloads/Drugs/.../Guidances/ucm071185.pdf. Accessed July 22, 2014. Prokocimer P, De Anda C, Fang E, et al. 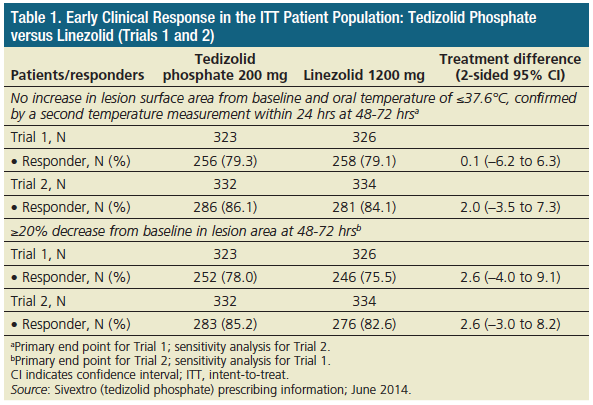 Tedizolid phosphate vs linezo­lid for treatment of acute bacterial skin and skin structure infections: the ESTABLISH-1 randomized trial. JAMA. 2013;309:559-569. Centers for Disease Control and Prevention. Antibiotic resistance threats in the United States, 2013. Updated June 2, 2014. www.cdc.gov/drugresistance/threat-report-2013/pdf/ar-threats-2013-508.pdf. Accessed July 22, 2013. Mayo Clinic staff. Diseases and conditions: cellulitis. February 23, 2012. www.mayoclinic.org/diseases-con ditions/cellulitis/basics/causes/con-20023471?p=1. Accessed July 23, 2014. Gabillot-Carré M, Roujeau J-C. Acute bacterial skin infections and cellulitis. Curr Opin Infect Dis. 2007; 20:118-123. Klein E, Smith DL, Laxminarayan R. Hospitalizations and deaths caused by methicillin-resistant Staphylococcus aureus, United States, 1999-2005. Emerg Infect Dis. 2007;13:1840-1846. O’Riordan W, Green S, Mehra P, et al. 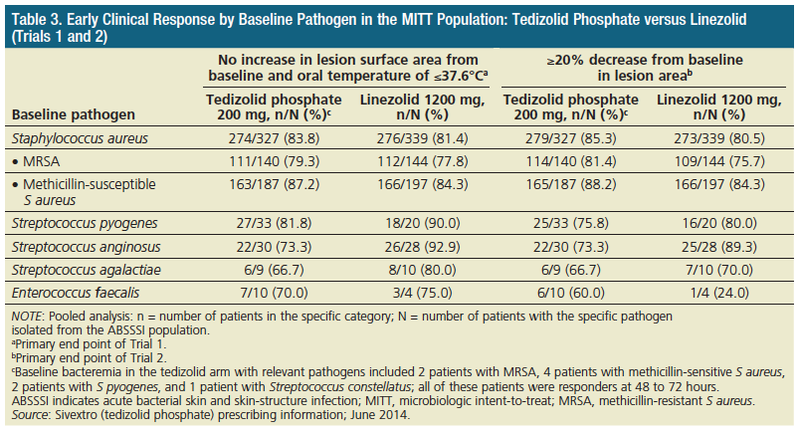 Tedizolid phosphate for the management of acute bacterial skin and skin structure infections: efficacy summary. Clin Infect Dis. 2014;58(suppl 1):S43-S50. Centers for Disease Control and Prevention. Methicillin-resistant Staphylococcus aureus (MRSA) infections: MRSA tracking. Updated April 30, 2014. www.cdc.gov/mrsa/tracking/index.html. Accessed July 22, 2014. Carleton HA, Diep BA, Charlebois ED, et al. Community-adapted methicillin-resistant Staphylococcus aureus (MRSA): population dynamics of an expanding community reservoir of MRSA. J Infect Dis. 2004;190:1730-1738. Cosgrove SE, Carmeli Y. The impact of antimicrobial resistance on health and economic outcomes. Clin Infect Dis. 2003;36:1433-1437. Hatoum HT, Akhras KS, Lin S-J. The attributable clinical and economic burden of skin and skin structure infections in hospitalized patients: a matched cohort study. Diagn Microbiol Infect Dis. 2009;64:305-310. US Food and Drug Administration. FDA approves Sivextro to treat skin infections. Press release. June 20, 2014. www.fda.gov/NewsEvents/Newsroom/PressAnnouncements/ucm402174.htm. Accessed July 3, 2014. Sivextro (tedizolid phosphate) tablet or for injection [prescribing information]. Lexington, MA: Cubist Pharmaceuticals US; June 2014. Smith M. FDA OKs tedizo­lid for skin infections. June 21, 2014. MedPage Today. www.medpagetoday.com/InfectiousDisease/GeneralInfectiousDisease/46430. Accessed July 22, 2014. Moran GJ, Fang E, Corey GR, et al. Tedizolid for 6 days versus linezolid for 10 days for acute bacterial skin and skin-structure infections (ESTABLISH-2): a randomised, double-blind, phase 3, non-inferiority trial. Lancet Infect Dis. 2014;14:696-705.